As documented in the World Future Fund Report, General Plan East: The Nazi Revolution in German Foreign Policy, the foundation of Hitler's geopolitical plans was the conquest of the European part of the Soviet Union. Hitler had hoped that he could reach a nonaggression pact with England before the war and launch this campaign in conjunction with a Japanese invasion of Russia from the east. In 1938 and 1939 British and French opposition to German plans for expansion in eastern Europe led to a situation in early 1939 where Germany was facing an ultimatum from Britain not to invade Poland. Hitler had absolutely no interest in attacking France or England, but the March 1939 agreement between England and Poland forced Hitler to totally reverse course and reach an agreement with Stalin concerning a division of Poland, similar to the agreement reached between Frederick the Great and Catherine the Great in the late 18th century. Hitler had hoped that this would intimidate England and France and make them willing to accept a German conquest of western Poland. He was dead wrong, and in September 1939 England and France declared war on Germany, turning a territorial dispute between Germany and Poland into a world war. Ironically, England and France did not declare war on the other partner in the conquest of Poland, the Soviet Union. England and France also violated their solemn assurances to the Poles that any German attack on them would immediately lead to a French invasion of Germany. 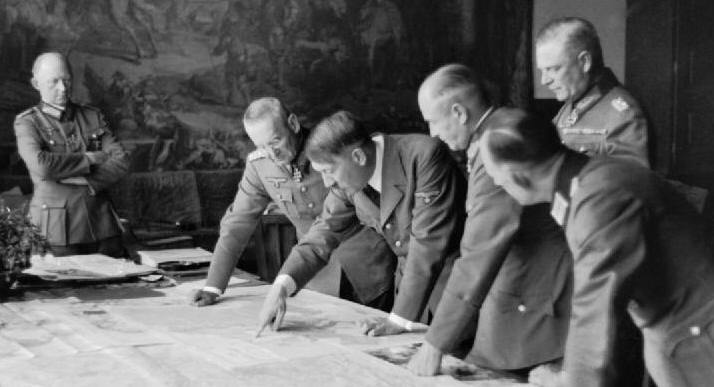 As a result, Hitler was able to concentrate almost all German forces in the east and crush the Poles while Britain and France sat behind their defenses in the west and sent no aid to the Polish forces. The pathetic collapse of the numerically superior Anglo-French military forces in May 1940 and the fall of France caused Hitler to again turn his attention to his primary goal. It is an example of the depth of geopolitical obsession with conquering Russia that even without reaching a peace agreement with England (now being backed by America) he began active planning for an eastern invasion.. These comments were made during an informal meeting of German military officers in the Special Command Train Atlas at the Bad Reichenall Station following the conference at the Berghof. These comments were made by General Alfred Jodl, the Chief of the Armed Forces Command Staff (Wehrmachtsführungsamt) in Armed Forces High Command - OKW. The comments were recorded by Jodl's subordinate, Colonel Walter Warlimont. "[Including myself] Four of us (Lt. Col. von Lossberg, Capt. Junge, Major Freiherr von Falkenstein) were present, sitting at individual tables in the restaurant car. ... Jodl went round ensuring that all doors and windows were closed and then, without any preamble, [he] disclosed to us that Hitler had decided to rid the world 'once and for all' of the danger of Bolshevism by a surprise attack on Soviet Russia to be carried out at the earliest possible moment, i.e. in May 1941. ... Jodl countered every question [we had] ... although he convinced none of us. ... He repeated Hitler's view and probably his own also that the collision with Bolshevism was bound to come and that it was better therefore to have this campaign now, when we were at the height of our military power, than to have to call the German people to arms once more in the years to come. ... Shortly after Jodl's disclosure, we happened to discover that Hitler had originally been determined to launch the attack in the late summer of 1940. The most urgent representations from Keitel and Jodl ... had been necessary to convince the Supreme Commander that the time and space factors alone, together with the weather conditions, rendered this plan totally impracticable." "[According to Hitler] Britain's hope lies in Russia and the United States. If Russia drops out of the picture America, too, is lost for Britain, because elimination of Russia would tremendously increase Japan's power in the Far East. Russia is the Far Eastern sword of Britain and the United States pointed at Japan. ... Russia is the factor upon which Britain is relying most. Something must have happened in London! (i.e., a reference to Britain's pre-war anti-communist stance being reversed) ... With Russia smashed, Britain's last hope would be shattered. Germany will then be master of Europe and the Balkans. Decision: Russia's destruction must therefore be made a part of this struggle. Spring 1941. The sooner Russia is crushed, the better. Attack achieves its purpose only if Russian state can be shattered to its roots with one blow. Holding part of the country will not do. Standing still for the following winter would be perilous ... Resolute determination to eliminate Russia." "In another conversation with Field-Marshal von Rundstedt on 2 June 1940 recorded by the l; General von Sodenstern who was present, Hitler said that now that he imagined England was ready for peace, he would begin to settle the account with Bolshevism. 13 July 1940. (After a conversation with Hitler) The question in the forefront of the Führer's mind is why England is still unwilling to make peace; like us, he thinks that the answer is that England still has some hope of action on the part of Russia. 30 July 1940. (An extract from an appreciation of the situation worked out with the Commander-in-Chief of the Army [Brauchitsch]) If we cannot reach a decision against England, the danger remains that England will ally herself with Russia; the question then is whether we should carry on a war on two fronts, one of which would be Russia. Answer: Better remain friends with Russia. 1. A thrust towards Kiev with flank on the Dnieper. 2. Thrust through the Baltic States in direction Moscow. Finally, pincer operation from north and south. Later a separate operation against the Baku oil fields. We can then see the extent to which Finland and Turkey are involved." Source: Warlimont, Inside, pp. 112-113, 135. "The Führer is determined to carry through this operation in the east since the Army will never again be as strong as it is at this moment and Soviet Russia has recently given one more proof that she will always, whenever possible, stand in Germany's path." "General Jodl ... during cross-examination in Nuremberg in 1946, stated: 'I was not the first who made preparations for an attack on the Soviet Union. To my surprise I discovered here [at Nuremberg], through the witness Paulus, that long before we [i.e., Wehrmacht High Command - OKW] concerned ourselves with any orders of this kind, plans of attack were already worked out in the General Staff of the Army [i.e., Army High Command - OKH]'"